The Goodlyfe duo, Moze Radio and Weasel TV are in talks with Vee Beiby, a top video vixen who has featured in Prezzo and P-Unit's videos. 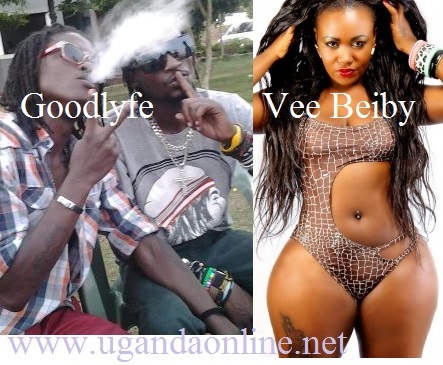 Vee Beiby got the You Guy video banned on Citizen TV just by the way she did her thing, so the next time you see her in a Goodlyfe video, do not wonder. One ardent fan of the model was overheard saying that: "This is the type of video vixen who can steal the show from the artiste through her sexploitation and the way she booty shakes." We recently asked our dear readers through facebook which track they would rather listen to between Goodlyfe's 'Magnetic' and P-Unit's 'You Guy', a good number of them were tending to the side of You Guy. The Goodlyfe are determined to making their weight felt in the Ugandan music industry and among others, they are now considering to feature top models in their forthcoming videos. Through Twitter, the Goodlyfe guys first asked the plus size model, Vee Beiby if she had Ugandan roots given her booty size and curves, the socialite and entreprenuer replied that she was 100% Kenyan. Meanwhile, It's not clear between Moze and Weasel who writes their tweets. They have just released two fresh hits this week, 'Ekyaama' and 'Crucify' in addition to 'Magnetic' and 'Obudde' which are already doing very well on both TV and FM radio stations. Some of their old songs like 'Nakutamani', 'Nyumbani' and 'Nakudata' are still worth listening to songs. The duo will be launching their next album in May but before that, the duo will be live in Amsterdam on March 30, 2013.